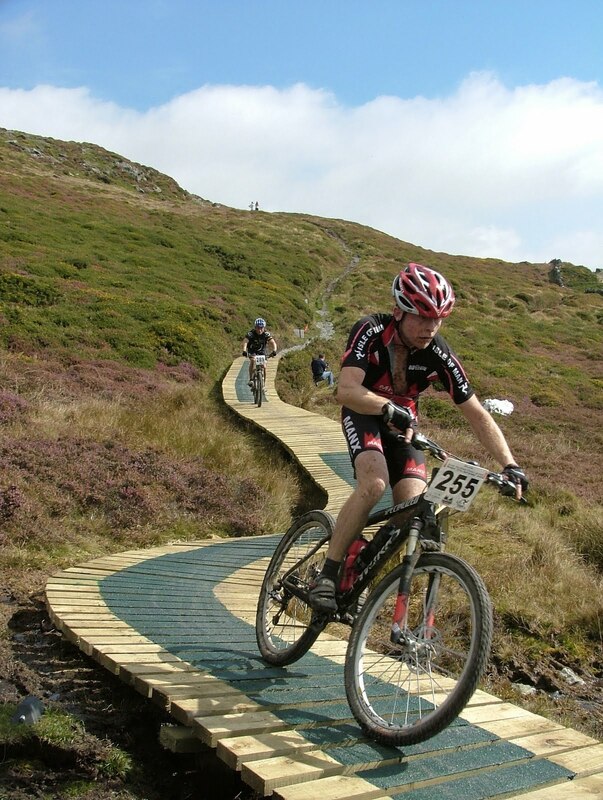 THE Manx Mountain Bike Club’s End 2 End Bike Challenge has had another massive surge of overseas entries this year and is fast becoming one of the highlights of the Isle of Man’s tourist attractions. Another record entry has been achieved this year – up by more than 300- and another 200 are currently on the waiting list, hoping to get the chance to ride the spectacular 46 miles route which is now rated as one of the best competitions in Europe. Riders from as far afield as Israel, Scandinavia and Australia will be on the start line at the Point of Ayre lighthouse on September 12th, with more than 900 of the competitors from outside the Island. The event is being sponsored once again by Sleepwell Hotels and organised by the Manx Mountain Bike Club. ‘It’s developing into a major tourist attraction,’ said Geoff Corkish MBE MHK, Political Member for Isle of Man Tourism. ‘The number of riders coming to the Island from the UK and Europe is highly impressive and this year’s entry shows just how popular the event is. The big surge in entries for the Sleepwell Hotel’s End 2 End Bike Challenge is also making the organisers consider expanding the event in the future. One idea is to run more than one race over two or three days, although the pressure on volunteer marshals is a concern. He said the event was over-subscribed by February this year and that the 200 currently on the waiting list were all keeping their fingers crossed that they might still have a chance of competing. The popularity of the Sleepwell Hotel’s End 2 End mountain bike challenge has resulted in a number of changes for the 2010 event, based on liaison meetings with the police over road safety issues. The biggest change is that the road between Bride crossroads and the Point of Ayre will be closed for an hour between 9.30am and 10.30am on the day of the race which starts at 10am. Heavy traffic congestion on the road in recent years led the organisers and police to agree on the roads closure and also to improve signage both for competitors and also spectators. The organisers are also providing riders with the option of transport to the start using coaches and lorries leaving Douglas early to get to the start line in good time. Around 500 competitors can be transported using this system. Lots of properties along the route will also receive a leaflet drop closer to the race day, to advise them that 1,400 riders will be travelling past their front doors, with the greatest congestion expected in the first few miles, chiefly in the Bride, Andreas, Sulby and Ballaugh regions, before the competitors hit the mountain tracks at Ballacobb, Ballaugh. The route has also been slightly changed in the Glen Rushen area to use a wider track than previously with the intention of providing more space for the record number of riders. The new route will be clearly signposted for riders. The winner in the last two years, former Olympian Nick Craig, is once again taking part and he starts as hot favourite to complete a hat trick, expecting to cross the finishing line in the very fast time of just under three hours. The slowest riders could take up to seven hours to finish the event. Local hopes are once again with Elliot Baxter who was the first Manxman home last year. Paul Kneen, Rob Sorby and Julian Corlett are also expected to do well. Julian is one of the favourites for the veterans over 50’s class title. He knows the route well as he is the man with the annual responsibility of marking out the course. TT Star Guy Martin is will be making a celebrity appearance in the race this year. Meanwhile, the organisers have issued a ‘polite warning’ to competitors that they must not get involved in any serious practising on the route as much of the course is on private land with livestock and will only be available to be used on the day of the event. Steve Honeybone added: ‘We know it’s tempting – particularly for local riders – to go out at the weekend and ride the course, but we have a very good relationship with the land owners and we don’t want it to be spoiled by someone leaving a gate open and causing problems for the farmers. For more information on the End 2 End Mountain Bike Challenge visit www.manxe2e.org.